Billions and Billions: Thoughts on Life and Death at the Brink of the Millenium (1998), 190. Dissent is the mark of freedom, as originality is the mark of independence of mind. 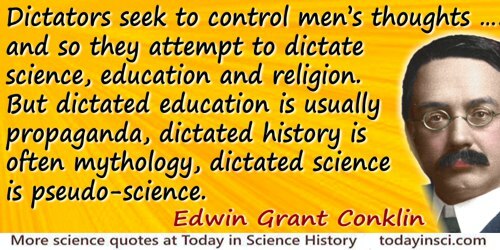 … No one can be a scientist … if he does not have independence of observation and of thought. Lecture, 'The Sense of Human Dignity', at the Massachusetts Institute of Technology (19 Mar 1953), printed in Science and Human Values (1959), 79. It is almost a miracle that modern teaching methods have not yet entirely strangled the holy curiousity of inquiry; for what this delicate little plant needs more than anything, besides stimulation, is freedom. Quoted in H. Eves, Return to Mathematical Circles. In A Letter to American Teachers of History (1910), 169. 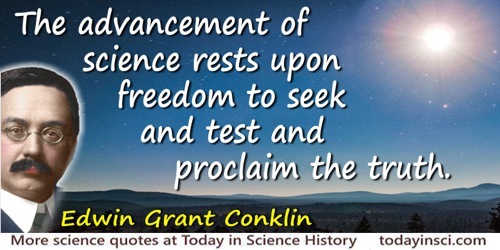 The advancement of science rests upon freedom to seek and test and proclaim the truth. 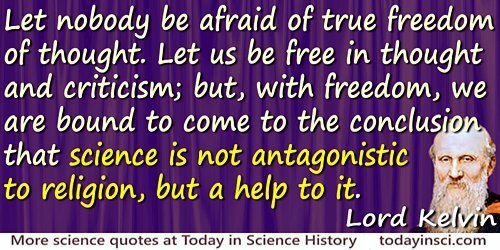 The great experimental principle, then, is doubt, that philosophic doubt which leaves to the mind its freedom and initiative, and from which the virtues most valuable to investigators in physiology and medicine are derived. The main objects of all science, the freedom and happiness of man. … [are] the sole objects of all legitimate government. From Letter to General Thaddeus Kosciusko (26 Feb 1810), Andrew A. Lipscomb, The Writings of Thomas Jefferson (1904), Vol. 12, 369-70. A plaque with this quotation, with the first phrase omitted, is in the stairwell of the pedestal of the Statue of Liberty. There are no inferior races; all are destined to attain freedom. We have learned that matter is weird stuff. It is weird enough, so that it does not limit God’s freedom to make it do what he pleases. From Gifford Lectures (Apr-Nov 1985), 'In Praise of Diversity', given at Aberdeen, Scotland. In Infinite in All Directions (1988), 8.